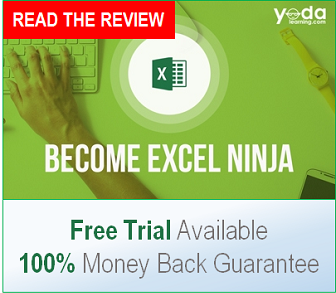 The vast majority of Excel users have never used VLOOKUP’s range lookup feature. Most Excel users familiar with the VLOOKUP formula are just conditioned to know that, when they get to the range lookup option portion of the VLOOKUP syntax, they should just put in the word “FALSE” because they want an exact match. This is because an exact match is what we want 95% of the time we’re using the VLOOKUP formula, and utilizing the range lookup option is just not a common requirement. 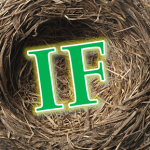 While writing a Nested IF formula is a very popular approach to address these requirements, there are a number of issues that make using it difficult. Nested IF formulas are difficult to write, prone to errors, and not scalable if you have several categories or bins. However, the VLOOKUP formula’s Range Lookup is definitely less flexible than a Nested IF, as there are certain specifications you need to ensure are in place before you can use it. It’s difficult to digest these criteria without context, so we’ll go through an audit of our setup to ensure that these conditions are met during the actual exercise. For simplification purposes we’ll assume that our data set does not contain negative numbers. 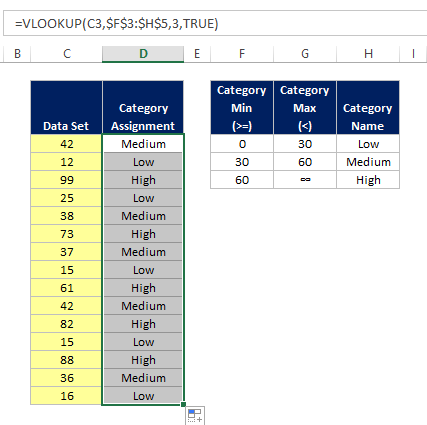 Since our setup is correct, we can now begin the category assignment process using VLOOKUP. Load your data into a single vertical column (highlighted in yellow below) and add a field next to it to assign it to a category. Remember that we’re not doing a lookup in the traditional sense here, where we’d want to find an exact match to our lookup number. We’re instead utilizing the range lookup and we only need to change a portion of the syntax to do so. This is the value we want to assign a category to. 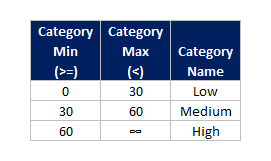 Hit the “F4” Key right after selecting your criteria table to reference lock it. Because our category name is in the third column of our table array, we’ll input the number 3. 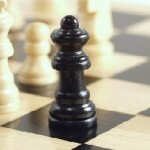 This is the key that makes VLOOKUP work in this particular use case. You could also just leave this part of the syntax blank to have it activate range lookup, but for the purposes of this tutorial, we’ll be explicit about what type of lookup we want. Before doing this, look back to Step 5 and make sure that you reference locked your table array before doing this. 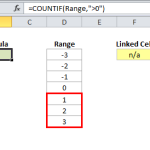 If this is already done, just double click in the lower right corner of the cell for the formula you just wrote, and the cells will copy down for you. We now have assigned all of our values to a specific category using the VLOOKUP formula. 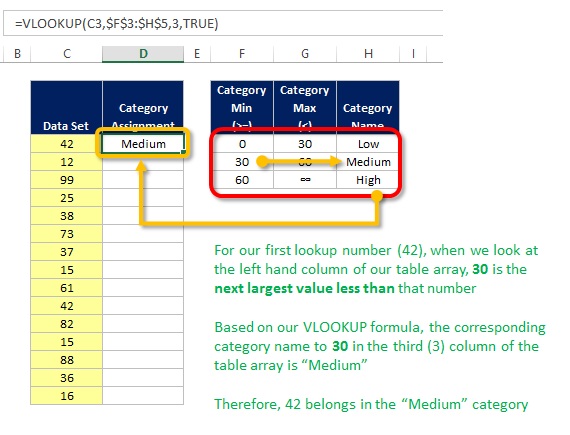 If an exact match is found → Excel performs an exact match VLOOKUP. If an exact match is not found → Excel returns the next largest value that is less than the lookup value. Excel looks for the next largest value within the left hand column of our table array that is still less than our lookup value. 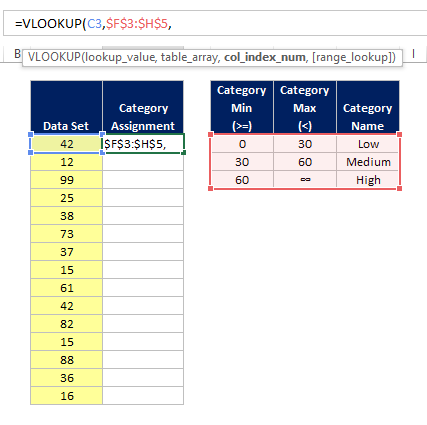 Because each of our category ranges are continuous (there are no breaks between them) this logic works out to be the exact same as looking for the category minimum of each of our lookup values. 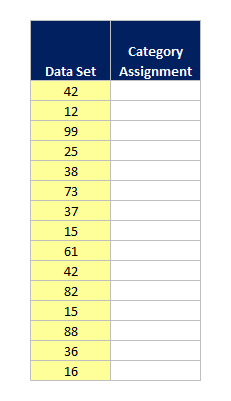 For 42, the category minimum is 30, because 30 is the next largest number less than 42. 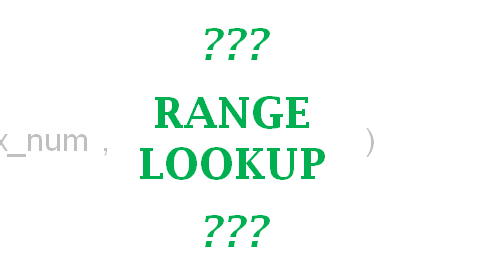 The Range Lookup feature of VLOOKUP remains a mystery to most Excel users in world. However, one specific use case does exist and based on our example, it turns out to be a much better option than using a Nested IF Statement. While VLOOKUP’s Range Lookup does have very specific setup conditions you need to put in place before you can use it, it ends up being much easier to write, less prone to errors, and much more scalable than a Nested IF. While it’s still not a common need, it’s worthwhile to learn VLOOKUP’s Range Lookup just to have this in your back pocket. This is very educative! More power to your elbow! 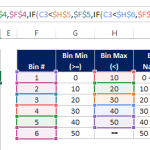 Kindly help me with a formula or a process in excel. Will illustrate with an example. Eg:Sheet 1 has one lakh database and Sheet 2 has 45000 database of same excel. I need to remove 45000 database from one lakh database in Sheet 1. Therefore the balance should be 55000 database. CAN SOMEBODY HELP ME IN THIS REGARD?????? copy and paste the 45000 in the same sheet as the 1 lakh and under the existing data. Then select the whole data (145000) and select ‘remove duplicates’ on the column that has the unique identifier for the record. It is now September so you probably have already figured it out … if not, hope this work for you. This is an excellent site, informative, very clearly written and presented. 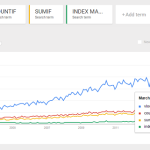 Best summary of Excel lookup functions I have seen. Well done. Thank you for giving me your best way to define the range lookup feature. Thank u and i m really glad to u.. Thanks a lot. Very good explanation. Can you explain if the value youre looking up is equivalent to the number that falls into 2 categories. In your example it would be 30 or 60. which category would 30 yield? This is very helpful and very well presented and simple to understand. Thanks a lot. Obviously this doesn’t matter in the example you gave, or for any similar situation; but it could matter in the general case of using approximate VLOOKUP. Very good explanation of a curious function. This is almost what I needed. Unfortunately, the number ranges I have are not continuous. I am looking up a few hundred sets of a few hundred non-sequential numeric sequences. I will end up having to use an array and Index and Match and Between or something similar. So is there a way to do this where the function, rather than looking up the next largest number still less than the lookup value, the function tries to see if the lookup value is within a specific range yet still not exact?